The retest for my failed mammogram turned out to be anticlimactic. I was at the hospital's imaging center at 8:20 yesterday morning and on my way out less than an hour later. The machine used for the scan was a different model than the one used for the previous scan but the process was identical. They took three images (each from a different angle), had me go wait while the doctor reviewed them, then told me everything is fine and sent me on my way. My first thought on getting the all clear was "Now I can call my mother." I've been avoiding talking to her until I knew what was what as I didn't want to worry her. She has enough on her plate with the after-effects of the stroke. Her memory continues to be wonky (worse that it was but not significantly different than my own memory issues). I can hear her struggling to find the right word and having the wrong but semi-related word come out is not uncommon. Mixing up the words "laundry room" and "kitchen" for example, with her telling me that she was in the laundry room emptying the dish washer when so-and-so rang the doorbell. I also think Rob and Diana are exhausted from worrying about her and from being the ones on call to take her places since she isn't allowed to have her car back yet. They got into it the other day as mom was at church, forgot her phone, and wasn't answering their calls. They thought she was dead. She was at church helping to folding newsletters and perfectly fine. They were mad at her for scaring them; she is mad at them for being mad at her. Anyway, the current plan is to go see mom on Friday, as we're spending Thanksgiving with Jean & Marshall (and probably Ian). Jean's home from the cancer treatment center (CHIPSA in Tijuana, Mexico) and I'm eager to see her in person. She's been posting to facebook so I know she's been doing well under their care but that's not the same as face-to-face. Last Thursday I took the night off from knitting and exercising and worry about cancer to go see a live performance of A Raisin in the Sun. It was interesting (and an excellent production) but it was like reading book one of a multi-book series. You know there's more to the story and the end of the book leaves you wondering what happens next. Also, I found the discrimination against the main characters to be unsettlingly familiar. You'd think we as a society would have been progressed more than we have since the play was written. Saturday was the first TubaChristmas Concert of the year. It went pretty well, particularly considering jebra hadn't played his euphonium since last December. 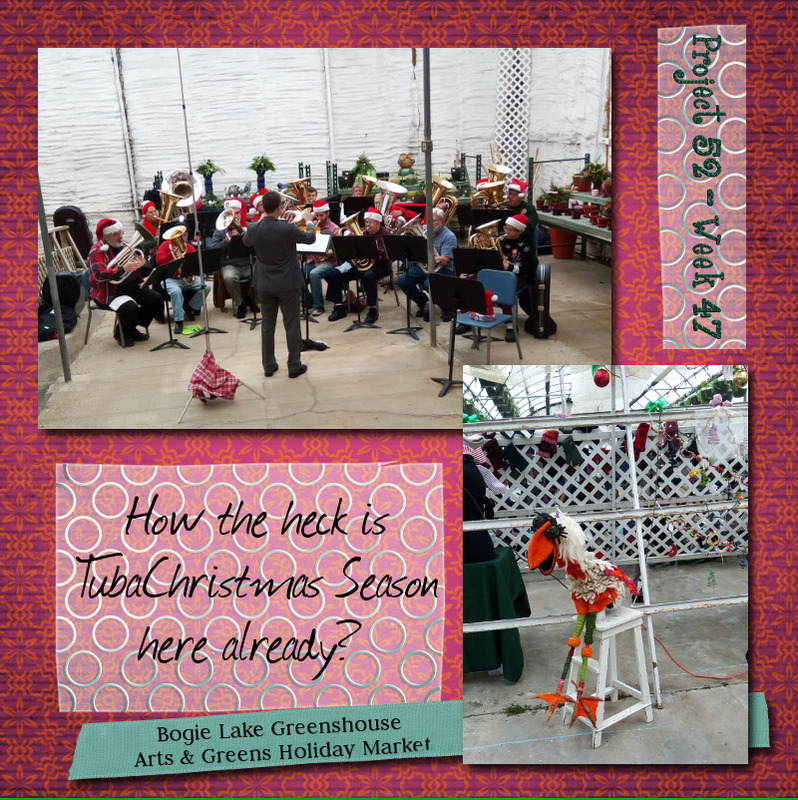 As usual, this concert was indoors during the annual Holiday Market at the Bogie Lake Greenhouse. Indoors was good as it was pouring down rain all morning and afternoon. I didn't buy anything at the market, which is somewhat remarkable as I saw some gorgeous skeins of hand spun yarn. I also discovered one of the sellers is retiring from raising alpacas and is selling off her herd. If I had somewhere to put them I'd have purchased a pair. This entry was originally posted at https://mrs-sweetpeach.dreamwidth.org/951901.html. First of all, glad the mammogram was clear! YAY! Secondly, ARGH! Family things are complicated. I can understand both sides. I hope the tuba Christmas season continues to go well!